A drill press is an upright fixed drill that can either stand on the shop floor or be mounted on a cabinet or workbench. It’s a common machine shop tool that drills holes or makes cuts in a workpiece by means of a motor-driven, rotating cutting bit. A standard requirement for any machine shop, the drill press is now finding its way into the home shop and DIY space. If you go beyond the typical weekend DIY tasks to get into complex wood working or light metal work, you should make a place in your workshop for a drill press. Handheld power drills can do a lot as far as punching holes goes, and light grinding or sanding is even possible. But when you are working on the parts and components of a larger item, need accuracy, have a lot of holes to drill, and want to be able to do some machining, you need a drill press. There is a fairly wide selection of affordable drill presses on the market today, and many offer features similar to a professional industrial tool at surprisingly low price points. Drill presses can be separated into two broad categories – bench top and floor or standing drill presses. They can be further separated by their drive systems. Belt-drive drill presses are hand-fed and generally used in light-duty applications. Heavier duty machines have gear-driven spindle heads and feature power feeds that drive the tool into the workpiece in addition to manual feed capabilities. A standing drill press is a heavy, powerful machine that sits independently on a shop floor. They have motors in the 3/4 to 1 horsepower range and can handle heavy drilling and cutting jobs in a wide range of materials. Standing drill presses are found in professional machine shops and industrial facilities and can cost tens of thousands of dollars. Bench top drill presses are lighter and more compact than standing models and cost much less. They generally have about 1/3 horsepower and are made for small jobs in relatively light material. Certainly there are bench top machines that can punch 1-inch holes through 3-inch steel, but they will do it slowly and cannot do hundreds of such holes. For DIY-type tasks in wood, sheet metal, light aluminum, thin steel, and plastic, a good bench top press will do fine. In this article, we introduce you to some of the best drill presses for the money in both the bench top and standing categories. We also cover a broad price range in an effort to meet the requirements of any tool-buying budget. Take a look to find the perfect drill press for your shop. The home or semi-professional user who is looking to handle all types of drilling as well as some light machining will want to check out the JET 350017/JMD-15. A belt-driven 1/2-inch chuck drill press with a locking collet that supports lateral bit forces is fitted with a dual-coordinate milling machine table to give the machine the capability to tackle face milling work up to 2-1/2 inches deep or end milling to 1/2 inch. This versatile tool delivers many of the build qualities, features, and working capabilities of its industrial cousins in a package that is small and affordable enough for the home shop. The 1 HP, 1 phase motor head unit rides on a 3-5/8 inch 1-piece cast iron column and has 15 inches of vertical travel and 360 degrees of swivel capability. Belt changes allow for 12 spindle speeds from 110 to 2,580 RPM. The Jet is a high-end tool, and it is packed with features. A heavy duty 3-speed power down-feed is coupled with a manual fine feed to let you handle nearly any type of material with no strain. The work table offers 23 by 7-1/2 inches of surface area and is lit by a flexible work lamp. The machine also comes with an angle vice, a carbide facemill, a draw bar, and an internal depth gauge. The 350017 is a very capable tool that can go far beyond what your typical home DIY drill press can do. This drill press/milling machine can hold it's own in a professional shop and makes quick work of any light metal, aluminum, or plastic machining project. We only found two downsides, one being the weight of the machine. It is about 36 inches high, which is typical for a bench-top press, but it weighs in at 370lbs. The pushes the bench top category so you had better have a sturdy bench and a strong friend to help get the Jet up there. There other complaint concerns some of the adjustments – changing speeds or adjusting the table height calls for loosening bolts and fooling around with the head and the motor, making a complex job out of what should be simple. Other than that, the Jet 350017 makes a very powerful addition to any shop. The Rikon 30-140 is a semi-professional grade drill press that adds a feature not found on the other machines in our review. 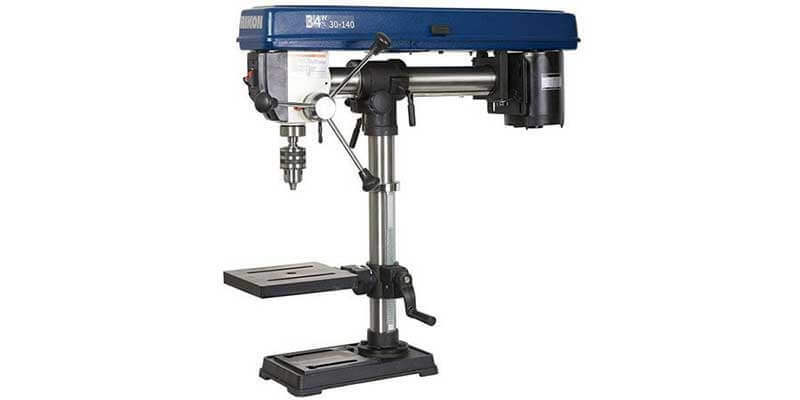 The head of this 5.5 Amp, 1/3 horsepower drill press is mounted on an upper cross-shaft that allows radial swing movements of up to 34” to the left and right. The spindle head can also be tilted, and depth settings range to about 14”. This radial and depth adjustment capability means that a workpiece can be clamped to the 7-3/4 by 7-3/4 inch cast iron table, then a series of holes or cuts made without resetting the workpiece, allowing for more speed and accuracy. The head tilt capability lets the head be set up to 45 degrees to the right or 90 degrees to the left in order to solve complex drilling problems. This versatile drill press is slightly oversized at 37” high by 14” deep with the spindle centered over the table, but it only weighs 84lbs. so it still fits the portable category. Other than the radial feature, the 30-140 shares much in common with most other bench top presses. It is belt-driven with 5 spindle speeds, runs between 620 and 3,100 RPM, and stands on a 2-5/16” column. The 5/8” chuck lets it run large bits, the spindle travel is a generous 3-1/8”, and an MT-2 spindle taper makes changing to end mill bits fast and easy. We liked the capabilities of the Rikon 30-140. It is slightly less powerful than some of the other machines in our test, but it compensates with its versatility. Being able to put several holes in a workpiece without moving really adds to efficiency and also allows for the use of jigs, which gives a major increase in speed and accuracy when working multiple pieces. The only downside is that all the movement and adjustment points make it a challenge to keep everything tightened up and true. The table in particular is prone to slipping or twisting out of place. However, once you learn to work with the Rikon, it is easy to adapt to these minor flaws, and this machine is very affordable for a well-constructed radial drill press. The WEN 4214 offers way into a large, powerful drill press at a very low price point. This press has a 5 Amp 2/3 HP motor, making it one of the most powerful home shop grade drill presses available. Another outstanding feature on the WEN 4214 is the mechanical variable speed that provides equal torque throughout the entire RPM range, cuts out the hassle of switching belts around, and lets you choose precise RPM settings between 580 to 3200. An LED readout displays the RPM speed. The cast iron base and table are very solid, and the work table is a generous 9-1/2 by 9-1/2 inches plus a roller extension that runs out to provide 17 inches of support. The work table has smooth rack & pinion height adjustment and tilts to 45 degrees left or right. The 4214 is a near-industrial scale machine that is 36-1/2 inches high, pushes 90lbs. in weight, and can cut a 5/8 inch hole through over 3 inches of cast iron. If you need to run tools like drum sanders, hole cutters, or mortising attachments, the WEN will be a good choice. A locking linear depth stop makes setting up repeating operations simple. A 2.17 inch diameter quill provides solid support for the spindle, and no wobble or run-out is detectable even with longer bits. A large front-mounted bump safety switch, an X-pattern laser, and a work light are detail touches that add to accuracy and comfort while working. WEN tools surprise us for their quality/price balance, and the 4214 drill press is no exception. The finish quality and detailing are not quite the same as what you find on presses in the $1000+ range, but this drill press runs and looks great for the price. It is an excellent drill press for the semi-professional or heavy DIY user. The Rockwell Shop Series RK7033 drill press is a compact but powerful bench top machine that offers 2/3 horsepower at 6.2 Amps in a 12 x 14 x 28 inch form factor. At just under 50lbs. this drill press easily qualifies as portable, and with a 1/2 inch chuck turning at five speeds from 620 to 3100 rpm, it is plenty capable of handling most DIY drilling and cutting jobs in wood, plastic, and light metal. The cast iron work table runs up and down the column on a smooth crank system and bevels 45 degrees to left and right. A 5-inch throat depth lets you work in the middle of stock up to 10” wide, with a 2” plunge depth on the cutting bit. A built-in depth gauge and safety-locked switch are two other useful features offered by the RK7033. This is a good basic drill press at a low price point. It is simple in design and does not have a lot of extra gimmicks, but it is built solid and will do most jobs asked of it including working steel up to about 3/8 inch. In materials much heavier than that, the machine starts to pull hard and vibrate. Changing speeds is simple, and the Rockwell comes with a removable chuck which means an upgrade to a key-less chuck should be no problem. The table is a bit undersized but it sits level, is easy to adjust, and locks down tight. The detailing on this drill press is not bad for a Chinese product, and it has more power than most other bench top presses. It runs quietly and with little vibration, and has no problem handling any type of wood work. When drilling steel, we noticed some run out, and you need to make sure the machine is assembled tightly and accurately or it does not hold a close tolerance in metal. The table tends to flex down a bit under heavy pressure, and this drill press absolutely must be bolted down because it is top-heavy and does not balance. At this price point, we do not expect perfection, and the RK7033 will do fine in the home shop for weekend DIY work. Like other tools from SKIL, the SKIL 3320 drill press is oriented toward the home shop owner and light-duty user. The 3320 offers a balance of quality, precision, and economy at a very accessible price point. This is a solidly-built drill press with a cast iron base and work table, yet it is easily portable as it only weighs around 50lbs. The 3.2 Amp 1/2 horsepower motor can pull between 750 and 3,050 no-load RPMs with 5 belt speed settings. The belt can be adjusted in seconds by simply flipping open the housing cover. Although this press is primarily a wood-working tool, it does have enough speed and power to run small-diameter tools for light metal working projects. When properly adjusted and used within its limits, the SKIL 3320 cuts smoothly and accurately with very little vibration or run-out. The nice thing about this SKIL drill press is the multiple features that you would normally expect only on a more costly machine. A depth stop system and 2-beam battery-operated laser guide help with accuracy, while the 7-5/8 inch work table tilts and locks at angles from zero to 45 degrees. The all-steel keyed chuck takes bits up to 1/2 inch in diameter, allowing for versatility when wood working. The large front-mounted bump off switch is a nice safety feature that you would usually only find on an expensive industrial-grade drill press. This is fine all-around drill press for the home wood worker and DIY handyman. We put it through its paces and only with the largest tool sizes and hardest materials were we able to get the belt to slip and chatter by putting excessive pressure on the pilot feed lever. The only downsides we noticed were the relatively small base plate and pilot feed arms. The SKIL 3320 is a good entry-level drill press. Craftsmen and home handymen looking to step into the high-tech future of drilling machines will like the NOVA Voyager, the first home shop drill press to be equipped with digital smart technology. Onboard software allows the user to set speed, depth, stop and reverse actions and other functions to run automatically. A performance monitoring feature provides the user with read outs on the machine’s performance and automatically adjusts to reach maximum efficiency. Everything is controlled from a back-lit digital screen. The Voyager takes a page out of the industrial CNC book with controls and functions similar to those found on machines costing hundreds of thousands of dollars. The digital interface on this drill press is actually quite simple, and is far less complex than most smart phones. A heart, the NOVA 58005 is a powerful 1-3/4 horsepower drill press with a high-torque direct drive motor. With RPM settings that range from 50 to 5500 RPM, the NOVA easily handles wood, plastics, metal, and even glass. An 18” swing and 6” quill stroke give the machine plenty of capacity, and it is built for accuracy with precision machining to high tolerances. A cast iron column, table, and base provide plenty of strength. The power head is surprisingly compact, and with no belts, operation is very quiet and smooth. The capability for precise speed and load control lets the Voyager completely outclass standard drill presses when it comes to handling work with specialty bits and cutting tools. The Voyager is an amazing machine and a lot of fun to work with. It’s great to have so much power running through a direct drive system, and it is very controllable. The digital interface is simple and the basics can be mastered in minutes. The only things we did not like were the fact that the software and system are only compatible with Windows computers, and there were some detailing issues on the work table, which was not perfectly true on the machine we tested. However, the table was nice and large at 16 1/2 by 16 1/2 inches, and it did lock down on the column well. If you can afford to go to the high-end, the NOVA 58005 is a great choice for a standing drill press. Jet tools are always a good choice if you can accept a higher price point, and the 354170 standing drill press is no exception. This is a big, heavy-duty drill press with a 20” throat, and 1.5 horsepower plus a 3/4” chuck and an MT-3 spindle taper makes it a great option for those wishing to run a variety of cutting tools. The spindle runs on precision bearings, and the spindle return spring tension is adjustable. A 12-speed range from 150 to 4,200 RPM offers the versatility to tackle nearly any type of material, and the press is rated for drilling through 1” cast iron or 3/4” mild steel. The work table is 18-1/2 by 16 inches and can hold 80lbs. of weight while tilting up to 45 degrees. The Jet 354170 is built well enough for service in a professional wood working shop, and it can easily handle light metal work as well. It has a 1/2 inch diameter locking external depth stop that adjusts quickly, and changing speeds is very easy as well. The industrial-style on/off switch is front mounted for easy access and the machine has a built-in work lamp. The work table has a threaded drain hole in the corner so setting up a catchment system for cooling fluids is a simple task. The weight of the 67” tall Jet 354170 comes in at 325lbs. This indicates its heavy construction and capability for hard work. If you are looking for a lifetime tool that can handle high-volume work, the Jet drill press is a great way to go. It is smooth, quiet, and powerful, and it runs cool even after repetitive cuts through hard material. Wood, plastic, and aluminum is nothing to this tool. One thing to realize is that this is a heavy machine, and installing the power head then positioning the drill press will take two people. The Jet is our favorite standing drill press. The Shop Fox W1680 is a mid-priced standing drill press that is built for use in small professional shops or home shops. A 1-horsepower motor with aluminum cooling fins runs a typical belt drive system that offers 12 speed settings from 140 to 3,050 RPM. The power head is mounted on a 3” cast iron column, and the whole machine is very stable but can also be bolted down if desired. A sturdy pilot drive handle runs the spindle through 3-1/4 inches of travel, and a 5/8” chuck allows for the use of large cutting tools. The table on this drill press is round, with a 14” diameter. It is very cleanly machined, can tilt up to 90 degrees, and cranks smoothly up and down the column. With the table fully lowered, there is 31-1/2 inches of drilling depth available. The Shop Fox drill press has some nice detail features considering its relatively low price point. A spring-loaded chuck guard gives protection from flying debris and moving parts, then flips easily out of the way for tool changes. The large, industrial-style paddle switch has a lock-out to prevent the press from being accidentally turned on, and an emergency bump off function. Adjustment handles are rubber-coated for a firm grip, and a built-in work light takes standard incandescent bulbs. We liked the simple, clean lines of this drill press, and it has an overall compact profile that lets it fit neatly into a shop corner. All functions of the machine worked well, and the motor has enough power to work through heavy material with ease as long as you adjust cutting speed to the hardness of the workpiece. The drill press was stable, but we would prefer it in a bolted-down configuration. We are finding that WEN tools provide surprising quality and usability at very accessible price points, and like the WEN bench top press we tested, the 4225 floor model makes a good option for the DIY shop. An 8.6 Amp motor, 15-inch swing, and 4 inches of spindle travel put the WEN equal in capacity with models costing more than twice as much. Ready to work a variety of materials, this drill press has a useful variable speed option that allows for adjustment between 280 and 1000 RPM without need for moving the belt, then step-ups from 1000 to 3300 RPM with the traditional belt adjustments. This capability increases accuracy on slow-speed cuts and make finishing work easier. Add on the digital RPM read out to allow for precision and very accurate replication when drilling in metal. WEN drill presses come loaded with features and this model is no exception. A precision-marked depth stop gauge and large emergency bump-off switch are standard. A laser x-point light and a flexible work lamp can be added. The 12 by 12 inch work table is precision milled and bevels to 45 degrees in either direction. The 5/8” keyed chuck is pure machined steel, and onboard key storage is standard. Solid cast iron used in the column and base keeps the drill press stable, but with a 170lb. machine like this, hold down bolts are always recommended. We like the build of these WEN machines, and even though the detailing may not match a higher-end drill press, the construction on the 4225 is heavy and built to last. The clean lines of this machine’s power head are attractive, and the beefy, all-steel adjustment levers and pilot drive crank work and feel great. WEN backs their products with responsive customer service centers, so you can buy with confidence. The WEN 4225 offers the most value for the money among our standing drill press line up. We have done a lot of leg work here to save you time and trouble in your search for a great DIY or semi-pro drill press. There are many great options here, and if you have a high-end budget the Jet machines are some of the best in the consumer category and are actually very good value for the money. They are comparable to professional industrial-grade machines. For those who like cutting-edge technology, the NOVA Voyager will be an obvious pick. We hope this article has been helpful. Enjoy upgrading your shop with a new drill press and remember to always work safely.